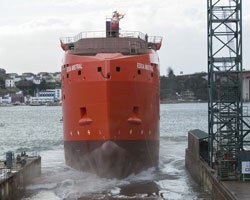 Spanish boatbuilder Astilleros Gondán has completed two sister service operation vessels (SOVs) for shipowner Østensjø Rederi. The duo, Edda Passat and Edda Mistral (the latter pictured, right) will service energy company Ørsted’s wind farms off the coast of the UK, including the 573MW Race Bank site and the 1,218MW Hornsea 1 array. Designed by Rolls-Royce Marine, Edda Passat and her sister each feature a length of 81.1m overall (or 72.1m between perpendiculars) and a moulded breadth of 17m, and have been developed to accommodate a 20-man crew and up to 40 turbine maintenance technicians, spread across 60 cabins. Each vessel has a depth of 7.2m, draws 5.4m and offers approximately 700m² of cargo deck space. Each SOV has also been fitted with a 23m-long heave-compensated, walk-to-work gangway, supplied by Norway’s Uptime, and an 11m, 10-man daughter craft, enabling technicians to sail to the site at a speed of 25knots in calmer sea conditions. Other kit includes: a deck crane, rated 2tonnes at 16m; a 3D motion-compensated crane, rated 1tonne at 26m; a 17.5m-diameter helideck; and a CTV landing system with bunkering facility. Four MTU 16V4000 M63L engines provide a combined power output of 8,960kW per SOV, while, propulsion-wise, each vessel has been equipped with two Rolls-Royce Marine US 205P20 azimuth propellers, rated 1,500kW apiece, and three Rolls-Royce Marine TT2000 DPN bow tunnel thrusters, rated 925kW each.This arrangement is sufficient to guarantee a service speed of 11knots for each support vessel, which can be increased to a top speed of 13.5knots. Onboard capacities per vessel, meanwhile, include 1 million litres of fuel oil and 450,000litres of fresh water.